How big is the EEPROM which can be used for sensor measurement data? • Measurement memory area which can be from 0 – 1052 bytes long. By default the complete User bank is used for the Measurement area. How many data points can be stored in the EEPROM? Can the System EEPROM be used for storing user data? Can the system EEPROM be accessed with the standard read and write commands? The system EEPROM can be accessed only with the cool-Log™ commands. Is it possible to access the EEPROM from the SPI? Yes, the EEPROM can be read and written from the SPI interface. Both interfaces (RFID and SPI) can be used in an application. What is the maximum EPC length in SL900A? The maximum EPC length is 128 bits. How many words can be used for application data? The number of words for application data is set with the Initialize command by a 9-bit value, so the reader can reserve up to 512 words in the User memory bank for the application. The total number of memory words in the User bank is 526. Please note that the words reserved for application data will not be used for logging. What is the Storage Rule Flag? The Storage Rule Flag defines how the chip will handle measurements when the Measurement memory area is completely filled. If the Storage Rule Flag is set to 0, the chip will not store new measurement data but will still increment the number of measurements at each timer event. When this flag is set to 1, the chip will continue with measurements and will store new data from the beginning of the Measurement memory area again. How can be determined how long SL900A has been actively logging data? • Number of Measurements (NM). How is the real time determined? Is it possible to do data logging from digital sensors connected to the SPI? SL900A acts as a SPI slave. As such it cannot initiate a communication. If a master device is connected to the SPI interface it can write and read the EEPROM. How can the logged data be read from the tag? The logged data is stored in the User memory bank in the Measurement area. It can be read with the EPC Gen2 standard Read command. The “Number of Blocks for User data” which defines length of application data can be read with the “Get Measurement Setup” command. Is data logging possible without a battery? Yes, it is possible for as long as the transponder is supplied with sufficient power from the reader RF field. As soon as the reader turns off the carrier signal or as soon as the transponder moves out of the read RF field, the logging is stopped. Is a different format for the Start Time possible? Any format for the Start Time can be used. The format used in the SL900A datasheet is the recommended start time. The format of the Start time has no effect on the chip functionality. How to design a dipole antenna for the SL900A? How should the antenna be connected? One pole of the dipole antenna should be connected to ANT and the other pole to VSSA. If a patch antenna is used the patch terminal has to be connected to ANT and the ground terminal to VSSA. Are external components required for the fully passive mode? No external components required in fully passive mode (without a battery supply). Is it possible to to power external components in fully passive mode (energy harvesting)? Yes, the VPOS pin will provide a voltage limited to 3.4V output with a maximum current of 200μA. 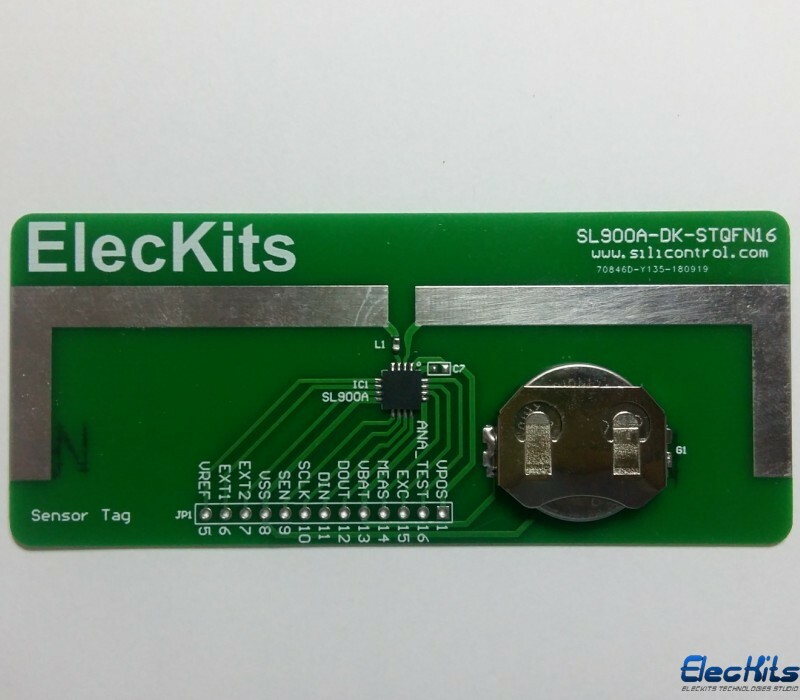 This voltage can be used for powering external components from the RF field. An external decoupling capacitor of at least 2.2μF from the VPOS pin to the VSS pin should be used in this configuration. Can the VPOS voltage be switched off? The VPOS pin is hard wired to the RF supply voltage regulator and is active (limited to 3.4V) as soon as the tag is in an RF field. How to calibrate the internal temperature sensor? The SL900A is calibrated during wafer sort at 35°C. Therefore there is no need for a user calibration. The calibration data is stored in the “off_int[6:0]” field of the calibration data. If required, the temperature sensor offset can be user calibrated at a different temperature point. Does the temperature sensor work also in fully passive mode? Yes, the temperature can also be read in fully passive mode with the “Get Sensor Value” command. Is it possible to measure the external sensor value with an RFID command? What kind of sensors can be connected to the EXT1 and EXT2 inputs? Nearly any kind of analog sensor can be connected to the analog sensor input. The sensor front end (SFE) is optimized for low-power sensors that can have an output signal depending on resistance, conductance, capacitance, voltage or current. When the SFE parameters or the Calibration data are modified no changes can be seen in the Get Sensor Value response - why? Each time that the SFE parameters or the Calibration value are modified, the "Start Log" command needs to be sent in order to load the new values form the EEPROM into the registers. If a logging operation is not needed the "End Log" command should be sent in addition (after the Start Log command). Can all commands be executed via the SPI as well? Yes, all commands can be executed via the SPI. The SPI can also be used for reading and writing the EEPROM and it can access the 8-byte FIFO used for fast data transmission between the microcontroller and a RFID reader. Are pull-up or pull-down resistors needed for the digital input pins (DIN, CLK, SEN)? Those pins already have 100kΩ integrated pull-down resistors. Yes, the EEPROM can be read and written via the SPI interface. Both interfaces (RFID and SPI) can be used. What is the reading range of the SL900A? The read range can be shorter if the transponder is held with bare hands, if there are some objects between the reader and transponder antenna and it can also vary from room to room because of reflections of the RF signal. Cool-Log command sent from the client computer to the ams reader for getting external 1 sensor value: 010900280323E0AD01. What is the command that IDS reader wirelessly sends to the SL900A transponder ? This command (code 0x28) performs the anti-collision procedure, selects a transponder, puts it to the Open state and sends the custom command Get Sensor Value - this is E0AD01. - Custom command E0AD01 + HANDLE. Please check the SL900A datasheet for a detailed description of the “Get Sensor Value” command. How to decode the reply [1B0936B9] that is received on the Get Sensor Value command? The actual data from the SL900A is the second part [1B0936B9]. - the remaining 16 bits are the HANDLE. What is the ISO / EPC protocol version that supported by the IC? The SL900A complies with the EPC Gen2 standard version 1.2. What is the read / write sensitivity? The read/write sensitivity in battery-assisted mode is -15dBm. Is the RF input differential, or two separate single-ended inputs? The input is single-ended. The antenna has to be connected to the ANT and VSS pins. How many bytes can be written with the BlockWrite command? The BlockWrite command can write 2 bytes of data (1 word). The advantage of using "Block Write" compared to a simple "Write" command is that the "Block Write" command does not use cover coding and so the reader does not have to send the "ReqRN" command before a "Block Write" command. So using the "Block Write" gives less communication overhead compared to using the "Write" command.